Whenever we find ourselves in a bad or potentially dangerous situation, we often hear the suggestion, “stay calm.” For some of us, this is a lot easier said than done. In a world where things are moving so quickly and happening so fast, it can be hard to slow down. The pressure from these quickly moving deals and the stress and anxiety of a progressively longer work day and higher demands can make it near impossible for us just to calm down. When we need to calm ourselves whether at home, work, during a business meeting, or all the time such as with generalized anxiety disorders, crystals can help. The soothing, calming, and tranquil vibrations of crystals can calm even the most anxious of minds. When our minds need time to unwind, relax, and calm down, turquoise color rays are potent and work wonders. Turquoise is a blending of the cold winter blue ray of Trust with the approaching warm green ray of Growth. It is the color of the earth as the new growth and life emerges at the first hints of spring. It is a fresh color, a welcome color, and a color that moves us to serenity knowing that the cycle of life is progressing rapidly. Turquoise is the Color Ray of Discovery and the Color Ray of Balance. Its vibrations help you find yourself and return to equilibrium in your life and feelings. The turquoise colored crystals help you relax, rewind, and build tolerance. 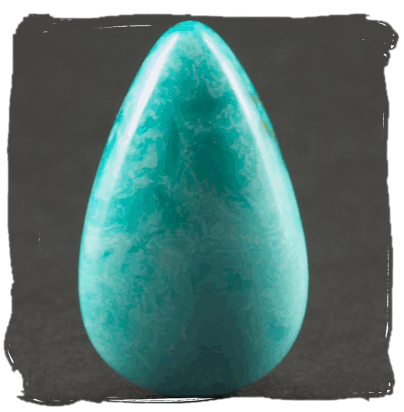 When you seek to reestablish your equilibrium and get your emotions under control, use a turquoise colored crystal. Excesses can be good. Hot passion, cool reason – both have their place. 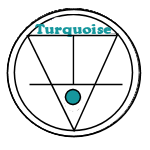 But when we need to re-center and find our true selves, Turquoise is the color ray of power that is best suited for such endeavors. When your life is out of balance, whether from too much passion or not enough, or too much activity or not enough, or whatever the imbalance, turquoise rays can get you back to center again. They temper excesses, restore calm after a storm, relieve stress, neutralize extremes, and provide a counter to tendencies to fly off in a single direction. They help you overcome conflict, and deal with rage. They moderate aggressiveness and help you deal with cruelty. They are antidotes to excessive passion drawing this power from their blue component. Imagine a beach of white sand leading to a tranquil lagoon reflecting a perfect blue sky mixed with the reflections of lush green vegetation – that is turquoise. Turquoise is perhaps the oldest stone in man’s history, the talisman of kings, shamans, and warriors. It is a stone of protection, strong and opaque, yet soothing to the touch, healing to the eye, as if carved from an azure heaven and slipped to earth. 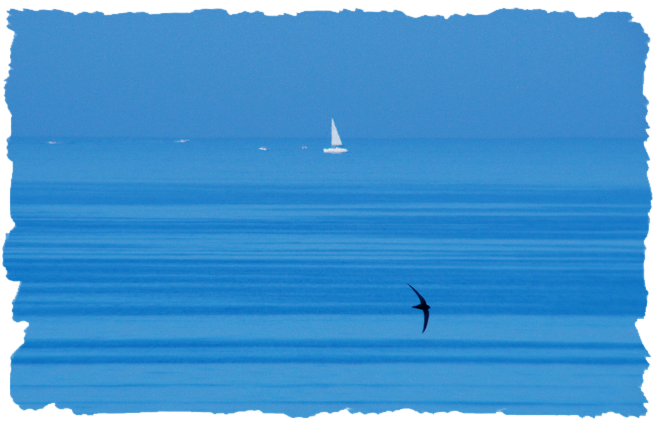 Its unique shade of blue, often blue-green, lends it name, Turquoise, to all things of this tranquil hue. Turquoise is a most efficient healer, providing solace for the spirit and well-being for the body. It benefits the overall mood and emotion by balancing and inducing a sense of serenity and peace. Holding or wearing Turquoise helps restore depleted vitality and lifts sagging spirits. It relieves stress and brings focus back to the center heart. It is empathetic and balancing, helping one to recognize the causes of happiness and unhappiness, and to master them. Chrysocolla is a peaceful and calming crystal. The serenity of its turquoise-blue color discharges negative energies, calms, and allows truth and inner wisdom to surface and be heard. A peaceful stone, it emphasizes the power our words and actions have on those around us, and encourages compassion and strengthening of character. Chrysocolla stimulates the initiative qualities of one’s character to release the distress of negative emotions and further the understanding of others. By accepting the perfection of the universe, it provides insights necessary to help re-align the physical body, intellect and emotions. This self-awareness and inner balance imparts confidence and enhances personal power. Chrysocolla utilizes Water energy, the energy of stillness, quiet strength, and purification. It embodies potentialities unrealized. It is yielding, formless, yet powerful. The Water element brings power of regeneration and rebirth. It is the energy of the circle of life. 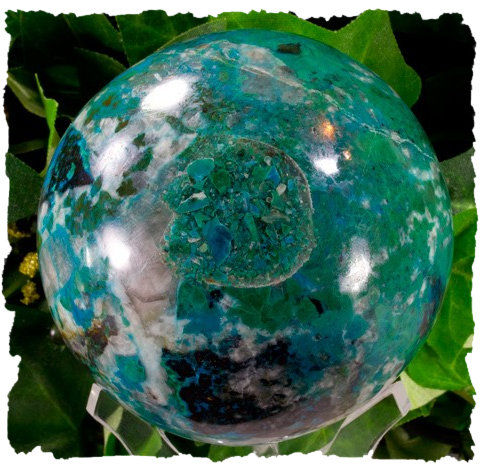 Use Chrysocolla crystals to enhance any space that you use for repose, calm reflection, or prayer. Turquoise is a stone of “earth-grounding” and is valuable in preventing one from losing touch with the conscious mind during deep meditations. It provides strength and protection during vision quests and astral travel, and due to its high spirituality, acts to improve meditation and to further peace of mind. Chrysocolla is a Dispeller Energizer crystal. Dispeller crystal lattices act like a radiator with sharp points from which energy can flow easily outward, carrying with it the undesirable elements of your life. They are helpful talismans to relieve everyday concerns of physical, mental and spiritual problems. Dispellers are also known as Restorers. 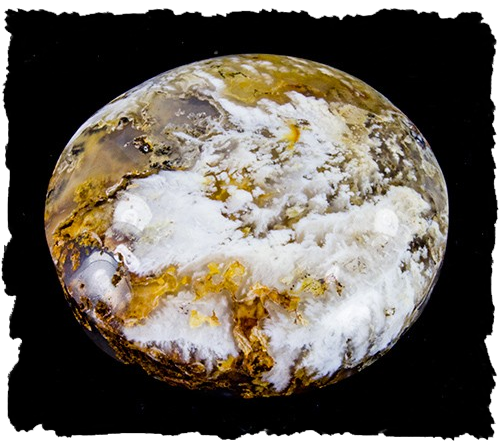 Judy Hall suggests Agate which is often used as a personal talisman to bring the power of the Moon to one's life and endeavors. Agate is a soothing and calming stone, it works slowly but brings great strength. Its multiple layers can bring hidden information to the light. Michael Gienger recommends Amazonite which is a stone of tranquility, peace, and protection from the undesirable elements of life. 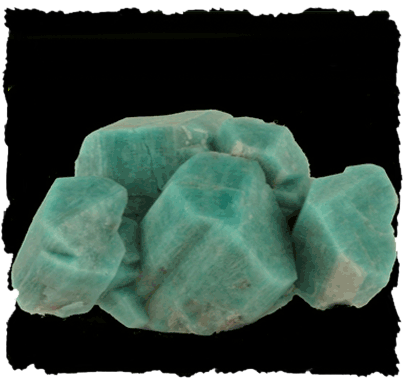 Amazonite balances extremes of moods and has a calming effect. It dissolves sadness and feelings of apprehension and encourages a healthy trust in God. 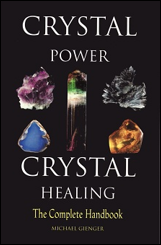 Robert Simmons advocates Aqua Aura Quartz which can serve as a real barrier against the undesirable elements of your life that are affecting your spirit and joy. 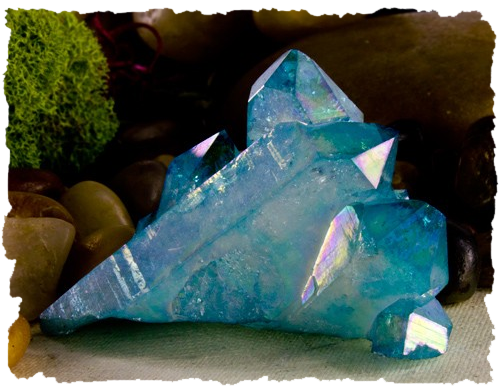 Aqua Aura Quartz has a calming and relaxing effect on the emotional body. It can be used to sooth anger, cool feverishness, and release stress. When things flare up in life or obstacles suddenly block our path, things can get hectic. We may not know how to handle or respond to sudden situations or bad news. In these times we need moments of calmness. You may also have a lot of stress or pressure in your life that is causing racing thoughts or lingering anxiety. 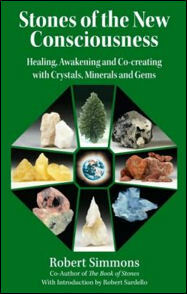 In any of these cases the calming and tranquil powers of beautiful turquoise colored crystals can help. They temper excesses, restore calm after a storm, relieve stress, neutralize extremes, and provide a counter to tendencies to fly off in a single direction. When looking to bring calmness to your life and spirit, we suggest turquoise colored crystals such as Turquoise and Chrysocolla. 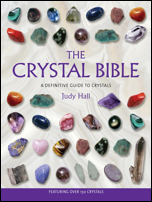 You can also try crystals other authors have recommended such as Agate, Amazonite, and Aqua Aura Quartz.